In fact, if you haven’t read them yet, feel free to read the articles here on Needle ‘n Thread about Trish Burr and her adventures in the needlework field. You’ll find some gorgeous examples of her embroidery in those articles, and you’ll also discover the many reasons why I admire her and her work. And now… the news! Prepare yourselves to be delighted and excited! TRISH HAS KITS! And they’re on her website and ready for sale! For US customers, you can e-mail Trish if you’re interested in a particular kit. She accepts Paypal. For customers in Australia and the UK, she has some shop listings there, through which you can purchase the kits. You’ll find four levels of needlepainting kits: beginner, intermediate, intermediate-advanced, and advanced, presented in five different needlepainting projects. You’ll also find kits available for two monogram styles. The prices of the kits are super reasonable. You can order them without threads – with the printed fabric, full instructions and thread list, for anywhere between ZAR 85 – 105 (US $10.07 – $12.45, according to the present currency exchange rates), or you can order them with threads (combination DMC and Soie d’Alger) for anywhere between ZAR 150 – 325 (about US $17.75 – $38.45) for the needlepainting kits. The monogram kits come with the full alphabet, fine linen, and specialty threads, for ZAR 175 – 185 (US $20.70 – $21.88). Remember, exchange rates fluctuate, so those prices are approximate, based on today’s currency exchange rate. These kits will be an excellent way – I am sure of it! – to learn needlepainting from Trish. You can rest easy knowing you have an accurate design transfer (the fabric has the design pre-printed on it) and no doubt her instructions are clear and easy to learn from. If you’re familiar with her books, you know this is the case! If you’re just starting to venture into needlepainting, the rose bud is a perfect beginner’s kit. If you’ve done a little but want to improve your skills, try the intermediate to intermediate-advanced kits. 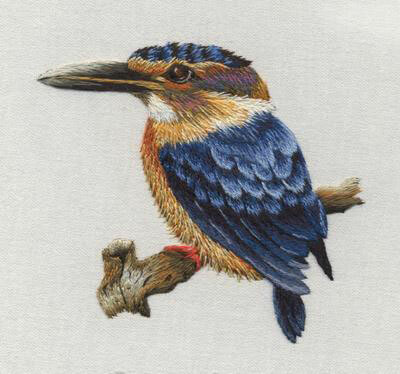 And if you’ve done a bit of needlepainting and want a new challenge – oh, you must get the kingfisher! I am completely twitterpated with this bird. The link again: Trish Burr Long and Short Stitch Embroidery Kits. Get ’em while she’s got ’em – they’re definitely stash worthy, too, if you don’t have time for them right now! November 30, 2012 Have You Seen These Miniature Needlepainting Kits Yet? I’m so glad you have brought this up. I’ve been admiring her kits for a few days now and would totally love to get one. I’m just screaming to get the bird but since I’m a beginner, I had better stick with the rosebud. Do you have any idea how much the shipping is for the eastern US? I really want to learn thread painting and so many times I try to do something on my own, I have even picked out a bird picture already but my good senses tell me that like everything else I do, I’ll start on it then when I have a problem because I really don’t know what I’m doing, I will get frustrated and loose interest. I’m trying really hard to push that picture to the side and get a kit with instructions from someone like Trish, or even you for that matter. I think the shipping is fairly reasonable – remember, there’s the currency exchange in your favor! You could always step from the beginner kit (the rose bud) to an intermediate. The rose bud is fairly small, I think: about 4″ x 4.75″ – so they aren’t “huge” projects, and and the simpler ones should go fairly quickly. I’d save the bird until you’ve gotten the whole long-and-short-stitch directional thing (and layering) down. It’ll help to work the beginner and intermediate level pieces first, if you already know you might get frustrated! Besides, then the bird will give you something to look forward to! Now, if you already know you’re determined to work through the steps to learn this whole technique (which can then be adapted to other embroidery pieces that you want to do), you could always order one at each level and save on shipping that way. And then you’d have them ready to go when you’re ready to move to the next step. Just a thought. I don’t know how long Trish’s kits will last, as I think she has made up only a certain number to test the market. Also, if you order the kits without threads, you can pick up the colors you need fairly inexpensively here in the States. I think each kit comes with a DMC thread list. If I were ordering, I’d order the poppy and the bird with threads, but the others, I’d go through my stash and see what I have on hand, then fill out with a few skeins of DMC from a local store. Thanks for the dubbing! I’m happy to be your online mentor! Wow! Thanks for the news Mary! It is because of you, that I found out more about her and her books…and I started purchasing her books, after reading your reviews. BTW I agree with Tammy, you’re definitely my embroidery role model! Thanks again for posting the news! Happy Birthday to your Mom. Yesterday was the first year’s anniversary of my Mom’s death and this was such a joy to read. My Mom loved needlework and taught all her daughters to embroider, knit, crochet, etc., which we all still do! And the prayer of St. Francis was our family favortie too. What a magnificent prayer. Thanks sooo much for the heads up on Trish Burr's new "training" kits !!! Thanks to your reviews on her books I was able to get 2 of them in order to learn the long and short stitch technique… hopefully I will get the hang of it sometime soon !! !